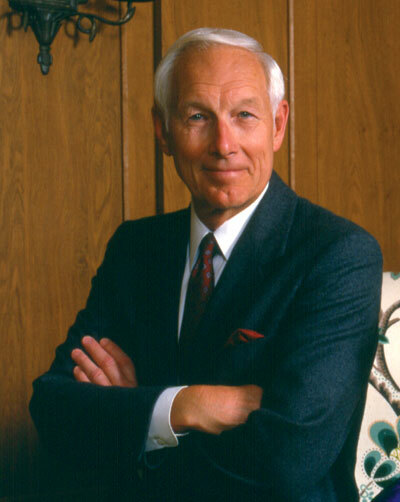 James H. Zumberge was inaugurated as the ninth president of USC on May 10, 1981, during a ceremony that was the capstone of a year of celebrations marking the university’s centennial. Building on an academic planning process that began early in his tenure, Zumberge was instrumental in defining the goals that became the basis for “The Campaign for USC,” the most ambitious fundraising program in the university’s history to date. When the campaign concluded in June 1990, it had raised $641.6 million, supporting a wide variety of capital projects, contributing more than $188 million to USC’s endowment, and boosting annual support of university programs to unprecedented levels. Among the more than a dozen major new buildings completed during Zumberge’s tenure were the Hedco Neurosciences Building, the General William Lyon University Center, the Cinema-Television Complex, Pertusati University Bookstore, and Zohrab A. Kaprielian Hall, as well as major additions to the Architecture and Fine Arts Library and Law School. The Health Sciences campus nearly doubled in size. A new teaching library (today’s Leavey Library) also was in the advanced planning stages. USC also made major strides in research during the Zumberge years. Sponsored research funding grew from $71.5 million in 1981 to $174.5 million in 1990 — a 144 percent increase. Major research initiatives, such as the USC-based National Center for Integrated Photonic Technology and the Southern California Earthquake Center, contributed significantly to USC’s emergence as one of the country’s premier research universities. University Libraries receive USC’s 2 millionth book, a 1557 edition of collected plays by the Greek dramatist Aeschylus. USC initiates the Faculty Research and Innovation Fund to help junior faculty get started on research projects. Former USC engineering dean Zohrab Kaprielian and internationally known cancer researcher Charles Heidelberger (both posthumously) become the first recipients of USC’s highest honor, the Presidential Medallion. The Domain Name System — what we know as “.com” and “.edu” — is developed by USC computer scientists Paul Mockapetris and the late Jon Postel. The XXIIIrd Olympiad comes to Los Angeles, and USC’s University Park campus is the site of the largest Olympic Village — hosting swimming, diving and synchronized swimming competitions. U.S. President Ronald Reagan visits the campus before officially opening the Olympic Games. USC President Zumberge creates the Office of Civic and Community Relations. A comprehensive university catalogue is published for the first time in 20 years. With the opening of the Carl’s Jr. restaurant on campus, USC becomes the first American institution of higher education to own and operate a fast-food franchise. USC inaugurates the world’s first doctoral program in occupational science. “The Campaign for USC” concludes, having added more than a dozen new buildings and raised $641.6 million for endowment, research and academic programs, and the campus environment — at that time the highest total of any campaign completed by an institution of higher education.